“The number of people choosing to cycle to work, to school, for errands and for recreation continues to grow every year in Ottawa, across the city.” This is the first line on a city of Ottawa webpage about cycling. The city likes to boast about spending millions of dollars to build segregated bicycle lanes while at the same time eliminating car lanes and parking spaces. That appears to encourage cycling. Of course it would. • Cyclists must be treated the same as car users in all forms of enforcement. Currently, the city is encouraging cyclists to ride on the sidewalks. There are projects where sidewalks have been converted into so-called “shared pathways.” A line is painted in the middle of the sidewalk and voilà, bicycles can ride on them. Needless to say, there is no speed limit. Let us not forget the added hazards of the skateboarders, roller blades riders, electric wheelchairs, and riders using cellphones. Cycling is a good recreational activity. However, as a mode of transportation, it is barely adequate at best. If done according to the law, it is not an efficient way to travel. It is time to rethink city planning or make cyclists as responsible as car drivers. It would be interesting to see actual logs with dates and times of so-called enforcement of the laws of the road, as well as a record of the number of fines levied against cyclists, over the past couple of years. If the law were applied and enforced equally between car drivers and cyclists, city hall would quickly see that segregated bicycle lanes are not worth the amount of money spent, as cyclists would just about disappear. It is time to bring back some sanity with cycling on Ottawa city streets. Cyclists’ lives depend on it, and I suspect most drivers are sick of and frustrated with them. Mayor Jim Watson’s intervention in a controversial bike detour on Holland Avenue has convinced the city to paint bike lanes and install flexible posts to create a safer route for cyclists for the next two years. The portion of Holland Avenue between Kenilworth and Tyndall streets has been identified as the detour for cyclists and pedestrians impacted by the closing of a footbridge over Highway 417 at Harmer Avenue. The city is demolishing the bridge this weekend before starting work on the replacement overpass. The city originally had a rough time finding a balance between providing a safe cycling route on the detour and retaining on-street parking spots on Holland Avenue. It decided to mix vehicular and cycling traffic, retain parking spots and let people bike on one of the sidewalks. Watson asked staff to review the detour after getting an earful from the public. Alain Gonthier, director of infrastructure services, summarized the changes to Holland Avenue in a memo to council on Thursday. The city will wipe the “sharrows” from the road and give cyclists a dedicated space. Sharrows are pictures painted on the road reminding users that motorists and cyclists are sharing the space. Under the new plan, which will be fully implemented by the start of the school year in September, 14 of 26 on-street parking spots along the southbound lane between Kenilworth Street and Fisher Park Public School, and six of 19 spots along the eastbound lane between the Fish Park Public School school and Tyndall Street, will be removed. Cycling on the west sidewalk will still be allowed during the detour. The painted cycle lanes will be 1.5 metres wide with a buffer zone 0.5 metres wide. The city will move the flex posts currently in the middle of the road to the cycle buffer zones. To fit the new cycle lanes, the city must remove the dedicated northbound bus lane. Earlier this month, council reduced the speed limit in that 450-metre stretch to 30 km/h. The speed limit was 50 km/h but 40 km/h in the school zone. Ottawa is a city heavily immersed in what we call “bike culture”. On any given day you can spot cyclists biking for transportation, sport or simply for fun. As with any activity there are different levels of cycling. Those who do it for sport are likely pedaling at higher speeds than those who are doing it for fun. So where do you go in the city if you want to cycle for fun and not be in the way of those cycling faster than some cars drive? Ottawa has many different bike lanes in and around the city and the number continues to grow. For a more leisure bike ride you might take to the Sir John A. MacDonald Parkway. Although many serious cyclists do frequent this bike path there is plenty of room for all cycling levels. With the beauty of the Ottawa river and views of Gatineau hills, the Parkway is an excellent location to have a leisurely cycle. Bring a snack and take a break to enjoy the beautiful scenery. What if you don’t live near the Parkway? Not to worry because as part of Ottawa’s commitment to cyclists there are bike paths located all over the city! For those who like to ride a little slower, the road is not necessarily the best place for you to be. Not only can it be nerve racking for the cyclist, but it is also dangerous for motor vehicles if a bicycle is travelling too slow and impeding the flow of traffic. There are plenty of bike trails that are off the roadways and provide a safe and oftentimes scenic place for slower biking to occur. Take some time to investigate around your neighborhood to discover the paths near you. Chances are good that there will be a bike path close by where you can ride at a leisurely pace. Don’t be intimidated by the professional bikers who glide by at top speeds without seeming to breaking a sweat. Find a path that suits your biking comfort level and safely enjoy your cycling time. At a time when we are seeing more bicycles on the road than ever before, we are also seeing more bicycle related accidents. Biking is an excellent mode of transportation for many reasons; they’re environmentally friendly, financially economical and provide a great source of exercise. However, for all of the many pros associated with cycling there still leaves room for cons such as accidents. As with many activities there is a certain level of risk associated with cycling on the road. To keep accidents to a minimum cyclists should always follow these five safety tips every time they mount their bike. Car and bike collisions are very common and often result in the biker sustaining injury. It is sometimes difficult for the driver of a car to see an approaching cyclist and so the onus of awareness falls to the cyclist. Do not make quick and unpredictable movements while in traffic. Be as certain as you can that the drivers see you and never assume that you are in their line of sight. Cars have pretty big blind spots and an approaching bike may not catch their eye. Helmets have been proven time and time again to save lives, so wear one. When cycling on a busy road you are left vulnerable to serious bodily harm in the event of an accident. Don’t be concerned with your hairstyle, be concerned with arriving at your destination in one piece. There is no greater danger than cycling at night with dark coloured clothing. As bikes are difficult to see in the dark it is up to the cyclist to make themselves visible to cars. Don’t wait until a car hits you to see you, wear brightly coloured clothing and be sure to have reflective tape on your bike as well as lights for night riding. Riding a bike is not the same as driving a car. In a car if you have music playing you can still hear sounds in your surroundings. On a bicycle you don’t have a speaker system and are left only with headphones to provide you with music. This is immensely dangerous as you may not hear someone yelling a warning to you, a car honk or any other possible warning signs you may need in order to avoid danger. Be smart about cycling and wait until you are at your destination to listen to your favorite song. The same rules apply to cyclists as motorists; do not operate a cell phone while operating your vehicle. This is especially important for cyclists to remember as their hands are required at all times for steering and braking. More and more cycling accidents are the result of cell phone usage while biking. This is entirely preventable and should not continue to cause accidents. Understand that when you take to the road as a cyclist you are taking your own life into your hands. Be aware of what is around you and follow the rules of the road. Be as visual as possible to your fellow drivers and everyone can live harmoniously on the same roads! Ottawa is an excellent city for cyclists. There are over 600 km’s of bike paths available in the National Capital Region. Many of these paths are not maintainable during winter months, however Ottawa is committed to maintain approximately 40 km of bike paths every winter. It is no small undertaking for the city of Ottawa to maintain these 40 km of bike paths. Ottawa typically has fairly aggressive winter’s and boasts quite a bit of snow during winter months. Even though temperatures can reach a shivering -40C there is still a large group of people who choose to hop on their bikes and go to work instead of hopping in a car or on a bus. For those extreme cyclists who choose to bike during the winter months there are some things they can do to make their commute easier and safer. Drivers change the tires on their cars to provide better traction in winter conditions; cyclists should do the same. Bicycle winter tires are a safety must for any cyclists who wishes to brave the Ottawa winter roads and bike paths. Winter cyclists should take further safety precautions beyond bicycle winter tires. Brightly coloured winter jackets are necessary for visibility by drivers. Wearing white or black jackets are both poor colour choices for winter winter cycling. Choose bright colours like orange or yellow to provide maximum visibility for your own safety. It’s also important to have a breathable jacket. Biking in the winter can be physically exhausting and the last thing you want to do on a cold winter day is sweat. If you sweat while moving at intense speeds you will freeze and possibly get sick when you slow down and the sweat has time to freeze. Wearing a jacket with proper vents for winter activity will allow you stay warm but also ventilated to prevent excessive sweat. If your route is of the 40 km’s of bike lanes plowed by the city in the winter then biking to work or for fun is a great idea. However if you are forced to bike on the road in winter conditions perhaps consider a different mode of transportation as the winter roads are dangerous enough with just cars to worry about. Slippery conditions can be excessively dangerous for a biker, and with narrowed roads due to snow piles there is not always enough room for a safe bicycle commute. Winter safety is very important to remember for all modes of transportation, but especially for cyclists. Winter biking can be fun and rewarding as long as the right precautions are taken such as bicycle winter tires, proper safety gear and general awareness of road safety. A van driver has been charged by police after he knocked over a man on a bike last Tuesday. It was the third time a bike and vehicle have collided since the bike lanes opened only two weeks earlier. The collision occured at the corner of Waverley and O’Connor streets at approximately 3:30pm EST. Luckily a cyclist going in the opposite direction was able to record the incident and posted it to YouTube. The driver of the van was charged by police with failing to yield the right of way. Another cyclist was knocked down in the bike lanes on the day they opened and another near the same spot on November 2nd. Ottawa police did confirm the video posted to YouTube of Tuesday’s incident was authentic. The cyclist was examined at the scene but fortunately he didn’t need medical attention. We all want our children to be healthy and live active lives. Cycling is a fantastic family friendly activity that can get everyone outdoors and in better shape. Before you take your children out on the bike paths, be certain to check the following 5 safety tips to ensure safe travels wherever you go. Most bikes are adjustable to accommodate for growth over time. Take time to properly fit your child’s seat and handlebars to their height. If your child outgrows their bike be certain to invest in a new one to ensure safety. It’s equally important to not have a child ride a bike that is too big for them. In Ontario it is law that anyone under the age of 18 is required to wear a helmet while riding a bicycle. Although it is not law for anyone over the age of 18 to wear a helmet it is good practice. Especially for parents to provide a good safety example for their children. The best way to ensure your children will be safe operating a bicycle on the road is to teach them at a young age about proper signaling and road safety. If you arm your children with the proper left, right and stop hand signals at a young age and teach them how to safely make turns on the road they will be safe travellers for life. Along with your child’s first bike be sure to give them plenty of brightly coloured clothing. Teaching them at a young age that visibility on the road is important could potentially save their lives one day. Reflectors and flashing lights added to the bike are always a fantastic extra safety touch. Take your child on a shopping trip and have them pick out some of their own bike safety gear! With the absence of a horn, bikes require a means to alert cars and pedestrians to their oncoming. Having a bell loud enough to be heard could be key to avoiding serious accidents. It is also a helpful tool in alerting slower cyclists of your desire to pass them on a bike lane. Bicycling is not only fantastic exercise but it is also an excellent source of exercise for children and adults alike. Teaching children at a young age the safe way to ride on the road and on designated bike paths is the best way to ensure their safety as they grow up. Although some bike for pleasure, others bike for sport. If you have ever taken a spin class you may have some idea of what it is like to bike up a mountain bike trail! For those who are dedicated to cycling there are some truly spectacular bike lanes in the Ottawa area. From a beautiful ride along the Ottawa River Pathway transitioning into a residential area that leads to an 8km bike path this east end trail is for both professional and leisurely bikers. At the end of this marked trail take an easy left to Petrie Island and enjoy the beautiful wetlands and beach area. For those looking for a long ride, take a trip east from the greenbelt near Blair Rd through the Village of Navan and explore the beautiful 20km Prescott Russell pathway. If 20km doesn’t peak your interest don’t be discouraged, the path connects to Prescott-Russell Recreational Trail at Canaan Road which spans 72km. The experimental farm is not only for animals! Ottawa is fortunate to have this beautiful farmland in the middle of the city which also hosts 8.5km of paved bike lanes. There are many sights to see along the way and this trip can be enjoyed by professional bikers or by a family looking for a biking adventure. Residents of Ottawa are lucky to have an expansive greenbelt running through the city. In the West end of the city the greenbelt trails are mostly flat and paved or stone dust. There are about 10km in the west end of greenbelt paths. The East end has about 4.5km of paths and is mostly stone dust. Becoming acquainted with the greenbelt pathways and discover the beauty the inner city has to offer! Whether you are looking for a challenging day up a difficult bike path or if you are looking for a leisure trek down the waterways, Ottawa is the best place to be for cycling fun. Back in the 1970s, after the Stop de Kindermoord protests, the Netherlands went through a period of rapidly revising roads. Research had to be done in order to find out what worked for promoting cycling, in much the same way as the UK started and then abandoned with “cycling demonstration towns” in the mid 2000s. The Dutch research is documented in an article by the Fietsberaad. One of the conclusions reached was that good quality cycle routes were of almost no use if they were not very close together. This conclusion appears on page 43 of the article referred to above (page 41 of the PDF file) where there is discussion of the result of building a few sparse high quality paths in 1975 in both Den Haag and Tilburg. The evaluation in 1981 were showed that these sparse cycle-paths had not significantly increased bicycle use. These paths were of good quality, acceptable even today. They were the sort of path that elsewhere might be referred to as a “superhighway”. 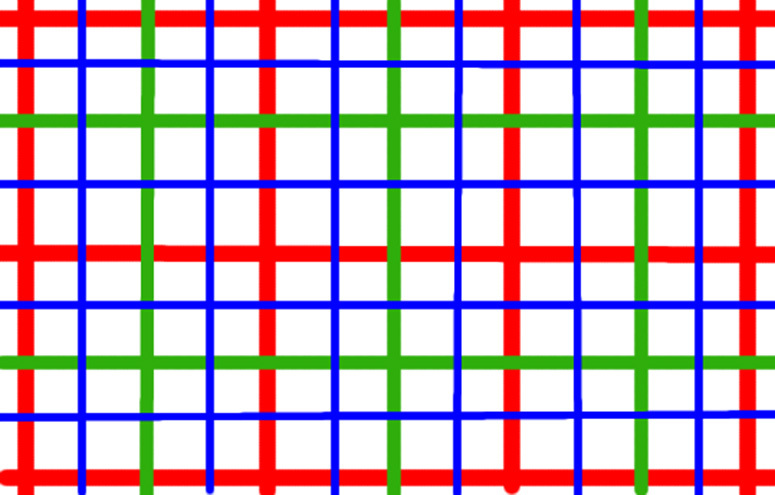 However, they were not effective because there was no real grid. i.e. they were too far from people’s homes and destinations to be of use to everyone on all their journeys. People won’t travel extra distance to get to a safe cycle-path, because the convenience has already been lost by doing so. Delft was the location of a different experiment. They built a three level grid. 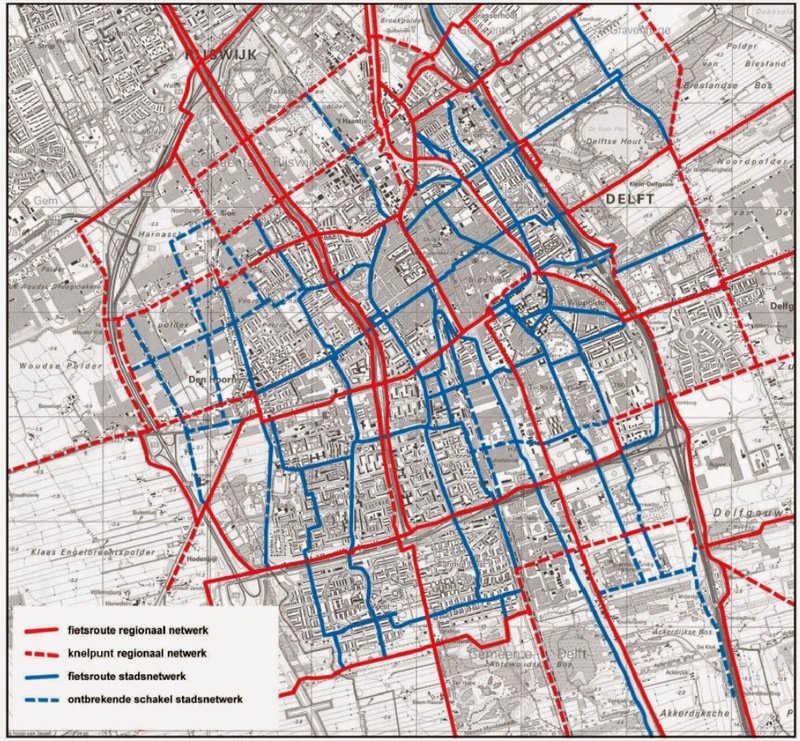 Here the city network had a a 500 m spacing, but there was also a district network with a 200-300 m spacing and a neighbourhood network with a 100 m spacing. These cycle facilities were within easy reach of every home and every destination and they brought about a permanent increase in cycling, as well as an increase in cyclist safety. It was concluded that policies discouraging car use are also needed, but the importance of a closely spaced grid of good quality routes for cyclists was established at this time and adopted quickly across the entire country. That is how it was established that good quality cycle paths should be a maximum of 500 m apart and that extra cycle-paths should fill in the gaps so that cyclists never have to make detours to attempt to use better quality facilities. The map at the top of this blog post comes from a presentation about plans for Assen given by the city architect on a recent Study Tour. The left half of the map at the top of this post is a close up of Kloosterveen, a new housing development of 8000 homes which is being built on the west of Assen outside the existing city boundary. This shows rough locations of just the primary-route cycle-paths through the suburb which provide access to schools, shops and other services as well as to the centre of the existing city and to the west to link up with villages and other towns. A new direct route to the city centre was built provided by 4 m wide cycle path and a 5 m wide bicycle road and over which the dual carriageway ring road was lifted on a new bridge. This attention to detail results in journeys from the new housing estate being quicker, more convenient, and more pleasant by bike than by car because there are no traffic lights on the route to the city centre by bicycle. The right half of the image at the top of this post is a map of Assen and surroundings. In total the map covers an area about 6.5 km across, so you can see how closely packed these cycle paths are. Note that routes also go well outside the city, to all commuter villages around Assen and all the way to other cities such as Groningen 30 km directly North and Hoogeveen 40 km to the South. There is a requirement within Assen that primary cycle paths are never more than 750 m apart. They’re usually much closer than that. However, all is not lost if you’re riding on a secondary route as these are also of very good quality. 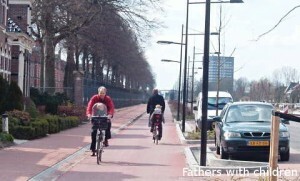 The photo on the right is of a cycle-path on a secondary route. It is three metres wide, not shared with pedestrians (they have their own 2 m wide path), it’s very smooth and direct, it is lit at night, and it is a pleasure to cycle on. Good maintenance is required not only on the primary network, but also on secondary routes like this. See another blog post showing how cyclists came first when there were road works in this location. Every area of the Netherlands has adopted similar guidelines. The grid of closely spaced high quality routes extends not just across one housing estate, not just across one city, not just to a few outlying developments of one city, but right across the entire country. Unravelling of motor vehicle routes from bicycle routes has also resulted in a denser network of direct routes being available by bike than by car. In practice this is how it works out for us: cycling from our home, in a culdesac we cycle not more than 200 m before we reach two different cycle paths which provide cycle routes to all locations. This is not remotely unusual, but rather what you’d expect for almost any residence in the Netherlands. See a video of one route from our home to the centre of the city. Some people may have noticed some similarity in the language above between the Dutch grid of cycle-paths and the grid of routes for cars which exists in cities in many other nations. For instance, Milton Keynes in the UK is a “new town” constructed around an extensive grid of car routes which are just as effective at encouraging driving as the grid of cycle-routes across Dutch cities is effective at encouraging cycling. Building this grid to enable driving was a deliberate decision. Milton Keynes was designed as an expression of the ideas of Melvin M Webber, an urban designer who was famous for his ideas about “mass automotive mobility” and who was known as the “father of the city” of Milton Keynes. Milton Keynes is dominated by cars today because this is exactly how it was planned to turn out. Dutch towns are dominated by bicycles because that is exactly how they were planned to turn out.